i was so proud and full of anticipation and enthusiasm travelling down to london with jackie and rod, knowing we would meet up with our buds, sue n dave (in fact, the whole kingston clan!) erin, gavin n helen, craig, iain, graeme and neil (all the way from south africa). with all the support and best wishes from our chums at home (and my coach diana on my shoulder), we had already won the best supported club in the world! as you all know sue, erin, rod, gavin and i had all qualified – and boy did we all race!!! the course for our event had been printed for some time, so i knew it very well from the map, or so i thought. different thing a printed map and an actual course, note to self, check the whole route out thoroughly!!! unfortunately i didn’t get the chance to cycle on the actual course, because of the constant racing, really disappointing as it was quite a technical course with 2 x 180 degree turns, a very fast downhill section into a chicane right and left and all this done at speed and 3 times. the weather was very wet too and we watched quite a number of young female riders on the thursday come off on the chicane, later that day i also watched some of the younger male triathletes taking the same bend downhill at speed – 4 abreast … wow! thursday night, racked the beast, 5.30pm, like him i was sooooo ready. we had to be at the race start 20 mins before, and were herded into pens (like sheep) prior to being shown out onto the pontoon. all the best to my bud rod and then goggles on, didn’t speak to another soul, race face on. allocated a position we had to start in the water one hand on the pontoon waiting for the klaxon… all that training, all the hype, i was so excited i thought i was going to explode! Gooooooooooooooooo! one massive gulp of serpentine and i was off, hammer, hammer, hammer, bit messy at the start but that was to be expected, i had planned to go hard all the way, get on fast feet if i could, but i was going through a new mantra… every second counts, every second counts. my swim is my weakest discipline, so i wanted to just smash it, go as hard as possible, trying to get a good catch, with my left arm especially… every second counts, every second counts. the swim is the only time you really use your arms in a triathlon, mine were burning, but i thought – its the world champs, the world bloody champs!!! swim was 1 loop in the serpentine, all left hand turns around the large yellow buoys, sighting was brilliant, the bouys were really easy to spot, also using the skyline as a reference there were easy sights to pick out on every stretch. i tried to get onto fast feet, did a couple of times but then they went off line and i was on my own. around the 1st buoy was a punch up, but gave as good… people swimming up my back, pushing me under – just kick harder!!! almost before i knew it we were on our way back towards the exit ramp, between the yellow and red buoys this time. my swim had gone well, up the ramp and out towards the transition. the transition was massive, on a grassy slope, a good 400m from the water exit, my hopes of a sub 1 hour race was never going to happen on this course. once off the grass at the exit from t1 the surface was great, very smooth tarmac onto the serpentine road, running mount leaving others stationary, then at the bottom of the serpentine road turn right and begin the 3 laps. every second counts, the beginning of the lap was a slight uphill pull for about 800metres, i had decided to attack at any point i thought the competition would be finding it tough, but on such a short tight course that sort of meant all the time. rod and i had discussed the chicane (uphill and downhill) that was where we could attack. everyone had to watch out on the 180 degree turns, with the traffic and especially with the wet surface, my back wheel kept on skipping out, just had to ease up slightly and hammer down right after the turns, i made a huge mistake at the end of the first lap. on the map it looked as though the turn was at the end of serpentine road, in reality it was a good 300 metres before. 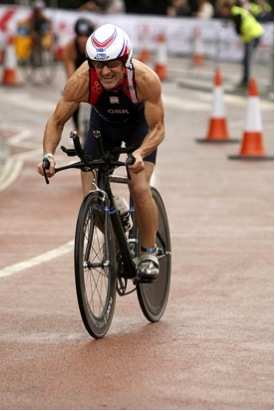 it was the fastest stretch on the course, i was keeping aero, body weight forward racing hard and missed the turn!!! i realised and turned through the cones, had to completely ignore what had just happened, just race harder, every second counts, every second counts. 2 more laps, hammering as hard as i could possibly go, the traffic on the course, not from our heat, was heavy in places, just had to keep shouting on your left and passing as quickly as possible. i didn’t have an issue with drafting as i passed everyone i encountered and fortunately at no point came across any pelotons. my dismount into t2 was spot on not missing a stride i began the long uphill to my rack, the grass/mud was a bit slippy but i managed to run fast the whole way guiding the beast with his saddle. i was at the top of the hill looking for my row number when one of the marshall shouted at me to keep to the left, he distracted me as i was looking for my row number and i went one past, back on track, dismiss any negative thoughts just keep racing, every second counts. down to my rack. i was in t2 quicker than an american guy, but with my row distraction he had passed me. helmet off shoes on and out! a big loop around the lower part of transition, i came up shoulder to shoulder with the american guy, i had the left hand racing line as we exited t2 simultaneously. at that time i didn’t realise we were in the same age group! we started off down the serpentine road together, he seemed to be running at my pace, just ignore him, race your own race! we got to the first right hand turn i jumped in front of him and cut him off, he sat behind me for a while then when back onto the long straight he came up shoulder to shoulder we ran together for a while then he upped it and stepped in front, i tucked in behind him. i had planned to race my own race, keep to my own plan, but i could feel how hard i was running and knew i was pretty much on pace, but i was being distracted. he was talking to me, saying come on GB, i hate that shout, i was beginning to think more about him than my race, he said to me use your home crowd, i decided to just try and ignore it. we ran this cat and mouse for the whole 5k, i would put in a surge, then he would… and so it went on, then i put in a faster push and he didn’t come right back, i did this a couple of times and he didn’t immediately react, i thought i had him in a sprint finish. we were quickly approaching the final kilometre, i thought, i need to go now, but thought, if i do go now i won’t be able to maintain this pace to the finish – i should have ignored it and gone. we approached the bridge for the final time, on crossing it we were almost at full pelt, he dodged around 2 slower athletes and i got slightly caught behind them, only 2 or 3 metres, but then we were on the final descent to the 180 degree turn into the chute, we were both going full out, full on, around the 180, it was only then, when the commentator said and we have a sprint finish for provisional 3rd place i knew he was in my age group, but at that time i had nothing left, i couldn’t make up the distance. we congratulated each other… but i was gutted …every second counts …every second counts!!! then i thought well there is another heat in our age group still to come in, and i knew there were a couple of fast british guys in the second wave, so thought i would get shoved back, but hopefully would still be in the top ten. as it turned out 4th was my final position, which in one way was horrific as i was only 1.8secs off the podium, but in another it was amazing as i was 4th in the world. as we all know hindsight is a wonderful thing, that unfortunately can’t be drawn on when you actually need it (if that makes sense!) but perhaps if i had not had such a tight race with the american i wouldn’t have run a pb? also what became apparent when the final results were published an Australian guy was only 9seconds behind me!!! i have decided thats just racing, you can train all you like, but its racing that makes you sharper. yes i made errors but its how you react to them on the day that counts, is there ever a race that you are totally happy with?? ?